Turn to Tiger Bath Solutions for beautifully customized baths and showers at unbeatable prices. When you work with the Plainfield bathroom remodel team at Tiger Bath Solutions, you can rest assured that your bathroom remodel will be smooth and efficient to best accommodate the needs of your household. Our Plainfield bathroom remodeling services will completely transform your bathroom from boring and outdated into an up to date, usable space that you enjoy. Read on to learn more about the many services our Plainfield bathroom remodelers can handle for you. Bathroom Remodeling – Don’t wait another minute to get started on the bathroom renovation that you have desired. Bathroom Conversions – Is your bathtub unused? Replace your bathtub with a brand new spacious shower that better meets your needs. Shower Renovations – Whether your shower needs repairs or needs to be replaced, Tiger Bath Solutions will execute the remodel with ease. 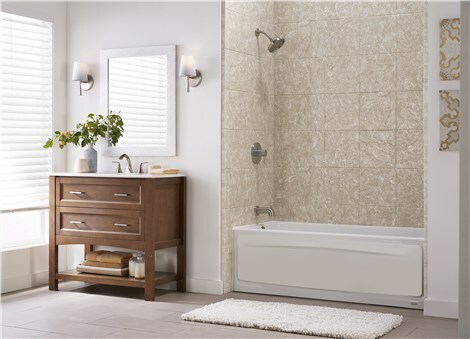 Bathtub Renovations – Clean up your bathroom look and feel with a new bathtub from our Plainfield bathroom renovation experts. Get started with our Plainfield bathroom remodel team today! Call our Plainfield bathroom remodelers or fill out our online form to request your in-home renovation consultation. Tiger Bath Solutions can offer you the Plainfield bathroom remodeling that will meet all of your needs, schedule and budget!